Century City has always been a high profile place. The city originally belonged to legendary cowboy actor Tom Mix between the years 1880 and 1940. Mr. Mix used the land for his own personal ranch. Then, it became a backlot of 20th Century Fox, which has its headquarters located just to the southwest of the area to this very day. The President of 20th Century Fox from 1942-62, Spyros Skouras, and his nephew-in-law Edmond Herrscher decided to develop the land for real estate use in 1956. The next year, in 1957, Skouras and Herrscher commissioned a plan from the company Welton Becket Associates, who unveiled the city at a major press event on the "western" backlot later that year. Four years later, Fox sold around 80 acres to developer William Zeckendorf for a whopping price of around $300 million. The new owner dubbed Century City as "a city within a city”. Day and night makes a difference in a town like Century City. The total population of Century City is 5,513 in the 0.70-square-mile Century City. However estimates that the daytime population amounts to 48,343 on a working day. That is a tremendous amount of people and traffic in a very small area bounded by major boulevards. 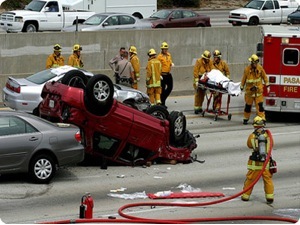 Even in a small and almost perfect place like Century City, personal injury car accidents still occur. That is why you need the best injury and accident lawyers on your side. For over four (4) decades, we have been fighting for people just like you! The Law Offices of Gary K. Walch, A Law Corporation, is comprised of a group of caring, compassionate and hard working attorneys. We strive to assist in handling your injury claim to the best of our abilities, while trying to make your situation as bearable as possible. Our firm deals with insurance companies and large corporations on your behalf you so you do not have to. However, our firm is committed to providing our clients with over 40 years of expertise in all areas of personal injury law. We aggressively pursue your rights while figuring out all of the appropriate remedies for your claim. Our top accident attorneys will use our experience to be tough and do what ever is necessary to protect your rights and interests. We have resolved thousands of accident, liability and personal injury claims throughout the entire state of California and we can help you. Our experienced injury attorneys have recovered millions of dollars for our happy clients. Our entire firm concentrates in handling personal injury cases and we have won over 95% of our cases, claiming more than $100 million in winnings, which is an astounding success rate. You don’t have to go anywhere or do anything. Just call now the top law firm for Century City today for a completely FREE initial consultation. We will discuss with you and your family how we can best help you resolve your legal problems and serve all of your needs. Please Feel Free to Give Us a Call any Time at 1-866-Injury2. You Will Want Your Injury or Accident Claim Handled as Quickly as Possible. Burns, bites, slips, falls, on any premises. Did any of this happen to you? Give us a call right now. No matter the size or shape of the vehicle, we handle vehicle accidents of all kind, from bicycles, to motorcycles, cars, trucks, trains and even buses. It does not matter whether you were involved as a driver, rider or pedestrian, we will take care of you. Was the other party uninsured? Do not worry, you are covered. Make sure to contact us right away. Our law firm is the one to call for very serious claims of catastrophic injury or wrongful death. Do not hesitate. Get in touch with us immediately if you know someone who was involved in a catastrophic injury. Remember, we work on a contigency fee. Don't wait to contact The Law Offices of Gary K. Walch, A Law Corporation, today for a free initial consultation.